Should I use bleach...why not? Managers... Can cleaner air improve your profitability? Ducted Air Solutions is committed to providing you with peace of mind and the highest assurance that all work is of optimal standard. Commitment to maintaining these standards, far exceed legislative requirements. This has created a reputation for industry leading operational standards and quality of works. When comparing HVAC maintenance providers, determining the level of compliance in Australia can be hard to determine. This is due to the fact that there is no trade standard or qualification requirement for IEQ (Indoor Environmental Quality) or IAQ (Indoor Air Quality). Therefore, DAS staff have undertaken online training through the USA based NADCA (National Air Duct Cleaning Association). 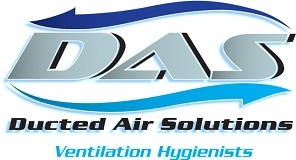 Through NADCA, our staff are qualified in ASCS (Air Systems Cleaning Specialist) and VMR (Ventilation Mould Remediation). While there are no regulatory bodies, AS/NZ 3666 and 1668 detail inspection intervals and hygiene levels which should be met. In addition, AIRAH (Australian Institute of Refrigeration Air conditioning and Heating) provide Best Practice Guidelines. It is through adherence to these standards and guidelines that DAS conducts their work. Sections of WH&S Act 2011, although not specific in nominating HVAC (Heating Ventilation and Air Conditioning), can be applied to human comfort and safety in their place of work. DAS is also a registered member of the National CM3 Quality Assurance program. This commitment to best work practice and optimal work methodologies, provides peace of mind in the quality of works received. Along with our commitment to researching the best available methods globally, also enables us to provide you some of the best advice available… often resulting in greatly reduced maintenance and operational costs, with improved reliability and air quality. To experience the difference for yourself, contact Ducted Air Solutions on 1300 561 390 or via the form below.